If you’re confused by all the technology planning required by your New York State K12 School District, you’re not alone. If keeping track of ever-changing technology systems wasn’t enough, NYS school districts are confronted by additional challenges for technology planning including that needed to apply for the district’s Smart Schools Bond Act allocation. Archi-Technology, an independent technology consulting firm, is helping more than a dozen NYS school districts cut through the clutter to develop Comprehensive Technology Plans, Instructional Technology Plans, and Smart Schools Investment Plans that take a holistic, integrated approach towards goals, gaps and funding sources. Infographics that convey key concepts relating to technology systems within a district with an emphasis on the “hidden” technology infrastructure you don’t see that is responsible for moving data within and between buildings. Enablement tools including technology meeting checklists and SSIP timelines and sample calendars. This material is available to your district on our new NYS K12 Technology Planning webpage at no charge and with no required registration. We hope you find the information helpful and welcome the opportunity to discuss your district’s technology planning challenges. Our thanks to the Times Telegram of Herkimer (NY) for their news coverage of Archi-Technology’s presentation of Central Valley School District’s Comprehensive Technology Plan to the Board of Education on Oct. 20. Read the article, then visit our website for more information about our Comprehensive Technology Plans for NYS K12 School District. This article from Health Facilities Management was recently shared with me and while it’s focus is on Healthcare Facilities, it’s strategic perspective on the value of a Cable Infrastructure is applicable to all facilities. 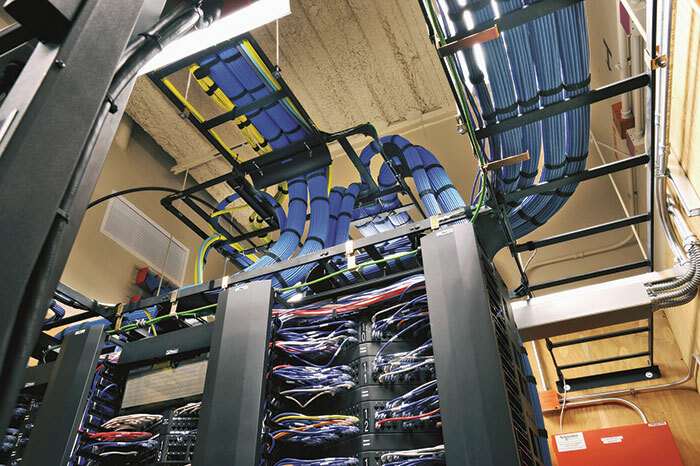 Over the past 20 years we have seen first hand how strategically and proactively designed spaces, pathways and cabling systems can help organizations establish an effective foundation on which they can reliably support the variety of systems that now require IP connections. In recent years, we have been working with a number of school districts throughout New York State as they establish just such a foundation to facilitate the delivery of education using 21st century hardware and software. Like just about every other facet of contemporary life, technology has woven itself into the fabric of today’s New York State public school districts from instruction and courseware to daily operations including safety and security. As such, we must recognize the need for a more strategic approach to the design and implementation of technology systems and related infrastructure in today’s K12 educational facilities. Failure to do so will result in wasted resources and disappointing attempts to integrate technology into modern day classes and curriculum. One primary issue of concern is the lack of understanding regarding the “infrastructure” needed to reliably support technology. Without a sound and robust underlying infrastructure of structured cabling, pathways and spaces, attempts to incorporate technology into today’s schools are destined for failure. This is as applicable to design teams that simply throw some cables and conduits on a drawing and call it a “technology design” as it is to service providers that “upgrade” the network without first considering the necessary supporting infrastructure. The issue is based on poor communications, not bad intentions; the IT and Construction/Facilities industries speak different languages. 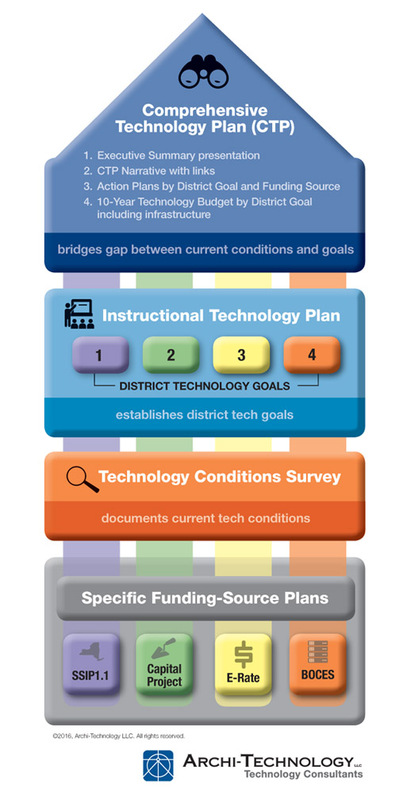 This graphic shows the relationship between a K12 School District’s Comprehensive Technology Plan (top), supporting material such as ITPs and Technology Conditions Surveys (middle), and resultant Funding-specific plans (bottom). All district planning activities including Instructional Technology Plans (ITPs), mission statement and goals, BOCES contracts, and capital projects. Instructional (student computing devices, whiteboards, projectors) and non-instructional (security, data communications, PA, etc.) technology systems. Cable plant and network infrastructure needs to support today’s technology systems. Funding Sources over a 10 year timeframe. Technology refresh rates and related budgets. Professional development of the teachers who will use the technology in the classroom and the IT staff supporting it. Actions Plans by both academic year and district goal. The graphic above shows the relationship between a district’s CTP and related elements including ITPs, Technology Conditions Surveys, and Funding plans. Has your district developed a Comprehensive Technology Plan? If so, please share your comments and experience. If not, here are some resources that might help you get started. Preliminary NYS Smart School Bond Act Guidance is now Available! School districts around NYS can finally learn more granular details about the Smart Schools Bond Act of 2014. 2.2 School leaders are encouraged to engage in strategic planning for use of these funds to build long-term capacity in their districts. Districts may find it useful to identify leaders in education technology to identify best practices. I hope you find the attached PDF useful in your K-12 NYS School District technology planning and, on behalf of Archi-Technology, we look forward to learning how we can assist your district.